Riverside Spa is the perfect place to relax your body, enhance your vitality and improve our look. Guest receive bathrobes and towels at the spa entrance. 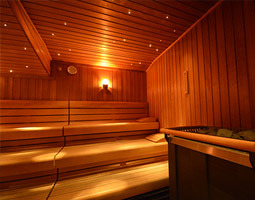 The spa contains a warm and pleasant environment where references to Icelandic nature is evident. Fire, ice, water, steam and the northern lights are tastefully incorporated into the design. 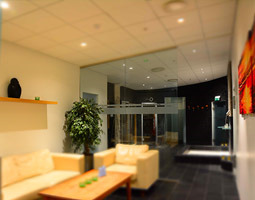 The spa offers traditional Icelandic steam bath and sauna, relaxation showers, seating area and a bar with light meals and drinks. 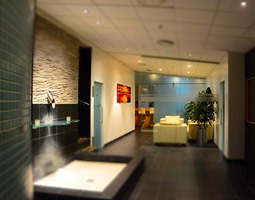 It includes a large and charming hot tub designed with the brightened sky in mind, filled with the northern lights and a relaxations room with comfortable chairs and candle lights. Riverside Spa provides a top of the line beauty parlour and massage services with a variety treatments and massage.